It looks like the attack of the locusts in Madagascar. 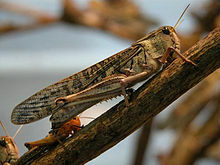 Large number of locusts can be found in about half of the island country. Locusts are insects that chomp on plants. The people in the country are fearful that the locusts will destroy their rice crop which is the basic food of the islanders. The United Nations Food and Agricultural Organization (FAO) is trying to get money for spraying pesticides over the land to get rid of these insects. Madagascar is the fourth largest island in the world (not including continents).